Well, I’ve just hit the 1,000 Followers mark!!! Yipee!! My dear friendCathe Holden from Just Something I Made, created the gorgeous graphic, from an old Marriage Certificate(you can find the original here on my site), that you see above just for my special day! Now don’t tell her that I told you. Shhhh! Sweet modest Cathe did not want to take credit for this lovely gift that she gave me, but how can I keep quiet about something sooo wonderful! Thank you Cathe! So today, in honor of this special occasion, I wanted to post something a little different as a gift to all of my readers. 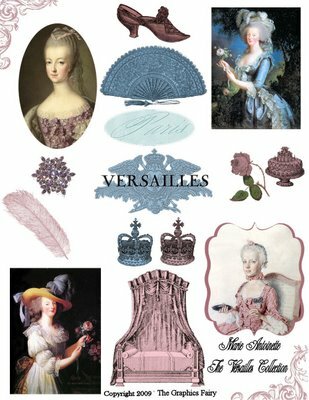 I am offering for free this lovely Digital Collage Sheet that I created just for you, entitled “Marie Antoinette” The Versailles Collection. 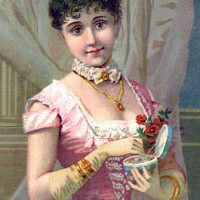 I’ve included some of my favorite vintage clip art images of Marie A. and some pretty accessories too. Make sure you click on the image to bring up the full size of the collage sheet, it is quite large. Please note, there is a copyright mark on the sheet, as this sheet may not be sold as a collection, however as with all of my graphics, you are free to use up to 4 images from the sheet on anyone project for resale or for fun! I hope you like it. And thank you to all of my 1,000+ followers, you are all greatly appreciated!!! wow, that is A LOT of followers…congrats!!! what a beautiful graphic from Cathe…and a generous gift from you…thank you!!! The announcement that your friend created is absolutely marvelous! Amazingly beautiful!!! Congrats on hitting the 1,000!!! Hi Karen! congrats on your 1000 followers!! that’s so neat, yipee!!! Love the graphic too, thanks for sharing it…hugs, Jennifer! Thanks! And Congrats on 1000 followers! I can’t even imagine that! I love you stuff and love having you as a resource when I want something special! Now that is something to celebrate,congrats on your 1000 followers!! The graphic from your friend turned out fantastic too! Thanks for the collage sheet! wow! that is some number. and i’m happy with 151! and the banner is gorgeous! i’d definitely keep it up there. just gorgeous. thank you for the collage. it’s awesome. and a big wooo hooo to you! heck, thanks for ALL the great pictures you offer. Thank you so much for sharing this – it is incredibly lovely! 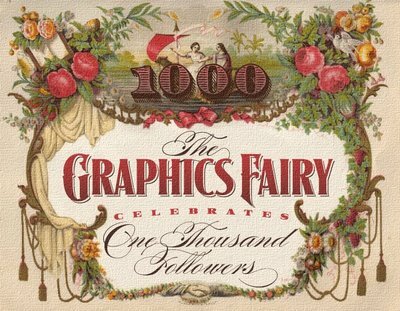 Many Congratulations on reaching 1000 followers – wow!!! Congrats! And this is so sweet of you. What a beautiful sheet..thank you so much! Congrats to you!! That is amazing!!! The graphic you created is outstanding!! I’m sure I will enjoy creating something with it. I always enjoy checking in with you everyday!!! Congrats on your first 1000 and many thanks for your daily images as well as this wonderful collage sheet. You make a lot of people very happy!! Congratulations…you do have a wonderful blog, thank you for sharing all your lovely images! Hello Karen and congrats on the big 1000! :0) What a beautiful design your friend created for you…that is a keepsake for sure! Thanks for the digital sheet..that is so generous of you. Lastnight I snagged a few more bird plates from your Etsy! I can’t wait to get the remodeling done so I can get them hung on the walls. Congrats!! I cannot tell you how much I appreciate your generosity and the time and trouble you take to share these wonderful images!! It’s absolutely gorgeous! Thank you! And congratulations on 1000 followers! Congratulations 🙂 and thank you for all the beautiful pictures that you have share!!! wow, 1000 followers, thats amazing! congrats! and thank you for your genorosity! Congratulations on your 1000 followers! And thanks for the wonderful Marie graphics! Thank you so much Dear Karen for your generosity that has always touched our Heart! With our kindest regards from Heidi’s Land. Wow, congrats Karen!!! And…thanks so much for the wonderful collage sheet! Thank you so much, Karen! The collage sheet is beautiful. I visit your blog every day and I really appreciate all the free graphics! You rock! Congratulations on reaching a thousand followers! hey Karen, congratulations! you are at 1008 as i type this…..may your numbers continue to grow ! Thank you for all the kindness you have so generously sprinkled upon us all! Thank you for sharing so many beautiful graphics..! Thank you so much. I love the collage sheet. Cindy W.
Oh wow, I see your 1000 has risen again. You are very talented and generous with your pictures. Thanks for the collage sheet. I LOVE the collage sheet!! Thank you so much. Congratulations on making 1000 followers! Congrats. You have made my granddaughter and my summer paper crafts a real fun filled experience. Thanks so much. Congratulations!!! Thank you sooo much for brightening up my day with gorgeous free images every day! I just love this collage sheet! Wow you are one popular lady. That is a lot of followers. Thank you so much for the graphic from your friend. It is my 35th wedding anniversary this week and I am going to do something with that for our anniversary. Thank you for the special gift. oh well done , what a beautiful tribute by Cathe . That is a lot of followers! I love your blog and so enjoy all of the wonderful images you share with us. Thank you! Congratulations Karen AND thank you so very very much. Marie has been much on my mind lately! Gorgeous Announcement too, what a perfectly lovely gift! Karen, can not tell you how much I enjoy your amazing ephemera collection that you so generously share with us all. You so deserve 1000 followers and more! Wishing you continued success, Kim. Congratulations on your 1000 follower!!! I only have 13 & 1 of them is me. LOL Thank you for your free graphics & lovely art. 1000…congratulations! That is a lot of followers. 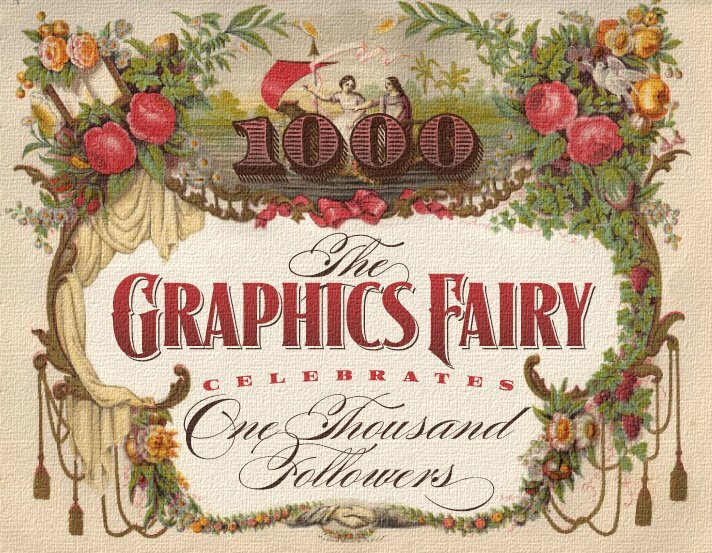 Thank you marvelous graphic pictures! Thank you! My mom is a huge fan, I have been wanting to make something with her on it for awhile now. I’m teasing you a little, but you do have a delightful and inspiring blog and this is a great mile stone! I just happened to come upon this July post. Congratulations on 1000 followers!!! Your site rocks!!! I love the Marie Collage Sheet. Thanks so much for sharing. Your blog is beautiful-thanks for sharing all your wonderful images! Many thank you Karen for this lovely “Marie” collage sheet. I was directed here by Patty Szymkowicz of Magpies Nest blog.